The Neumünster McArthur Glen Designer Outlet shopping mall offers shoppers big savings on brand name fashion in factory stores located within easy reach of Hamburg, Kiel, Lübeck and the Danish border. The Neumünster McArthur Glen Designer Outlet Mall is the largest factory shopping center in Northern Germany. Bargain hunters may save 30 to 70% off around 120 designer fashion brands in a dedicated factory outlet shopping village. Neumünster is around 40 minutes from Hamburg Airport, half an hour from Kiel, and an hour’s drive south of the Danish border. Cheap – and sometimes free – shuttle buses are available from Hamburg. 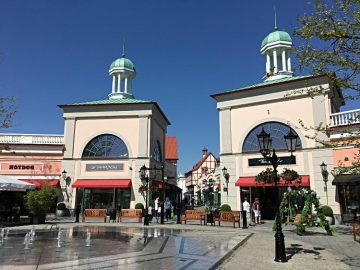 The McArthur Glen Designer Outlet Village just south of Neumünster in Schleswig-Holstein in Northern Germany is at typical European upmarket brands factory outlet shopping village. Around 120 brands are represented here in shops grouped like a pedestrian zone town center rather than a covered shopping center. 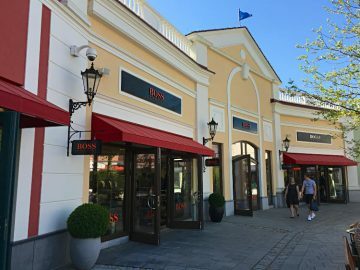 Shoppers generally save at least 30%, but often up to 70%, on top brandnames with factory outlet shops at the McArthur Glen Designer Outlet Village in Neumünster. Clothes on offer here are mostly overstocked items, or previous season versions. Shop soiled, factory rejects and B-grade items are very rare and clearly marked as such. The weather of Northern Germany is typically rainy and windy and with the locals fond of outdoor activities throughout the year, good deals are often available at the Neumünster factory stores on jackets and weatherproof clothing. The best deals are during seasonal sales – January and July are usually good sale months in Germany. Also look for bargains in the odd pop-up stores that are only open for short periods to move excess stock at the lowest prices. Some of the top fashion brand names at the Neumünster McArthur Glen Designer Outlet Village include Adenauer & Co, Adidas, Armani, Asics, Bench, Billabong, Birkenstock, Calvin Klein, Coach, Columbia, Converse, Daniel Hechter, Diesel, Escada, Fossil, Furla, Guess, Hugo Boss, Jack Wolfskin, Karl Lagerfeld, Lacoste, Levis, Mammut, Marc O’Polo, Napapijri, Nike, Polo Ralph Lauren, Porsche Design, Skagen, Superdry, Swarovski, Timberland, Tommy Hilfiger and Versace. Most shops sell top fashion labels but there is also a fairly large number of house ware shops – some sell very good quality German and European kitchen and dining utilities that make excellent souvenirs. Some of the brands with shops at Neumünster include Bassetti, Home and Cook, Kahla, Le Creuset, Möve, Victoriniox, Villeroy & Boch, WMF and Zwilling. Lindt also has a very popular outlet shop here with a large selection of chocolates. The best bargains are usually out-of-season items – Christmas stuff in January, Easter bunnies in May, etc. Great deals are also available on lucky dip packages. Samsonite sells luggage to carry all the bargains home but many of the other shops also have bags on offer. 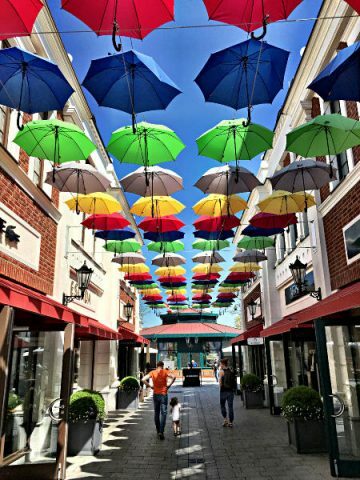 Eating and drinking options at factory outlet malls are often dismal but the Neumünster McArthur Glen Designer Outlet Village has several pleasant options. In addition to kiosks and food trucks, the village has six permanent regular restaurants and cafes. These include a Starbucks, Nordsee and Marché. 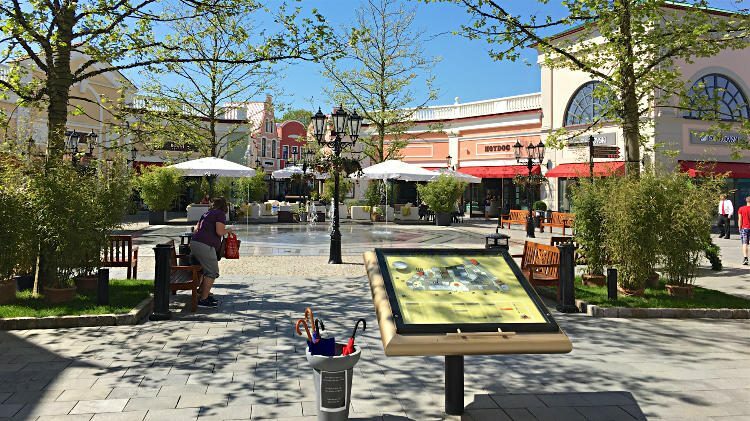 The Neumünster McArthur Glen Designer Outlet Village shops are open Monday to Saturday from 9:00 to 21:00. The outlet mall is closed on most Sundays and national holidays. Getting to the Neumünster McArthur Glen Designer Outlet Village, Oderstraße 10, 24539 Neumünster, Germany, is easiest by car but buses from the town center and shuttle bus services from Hamburg are also good options. The Neumünster outlet mall is conveniently for drivers just off the Neumünster-Süd exit on the Autobahn A7. Traffic depending, driving could be as fast as 30 minutes from Kiel, just less than an hour from Hamburg Airport, Schleswig or Lübeck, an hour from Flensburg and the Danish border or 90 minutes from Puttgarden (Denmark ferry). Parking is usually free but on Fridays and Saturdays the parking closest to the mall become Premium Parking at €5 per day – best booked in advance and combined with some discount saving vouchers. Further parking in the multi-story car park across the street from the mall remains free. The outlet mall is around 2 km walk from Neumünster-Süd train station and just over 4 km from Neumünster station. From Neumünster station, bus lines 7 and 77 in the direction Designer Outlet / Industriegebiet Süd stops directly at the outlet mall. On Thursday evening, and all day Friday and Saturday, shuttle bus services are available from Hamburg to the Neumünster McArthur Glen Designer Outlet Village. The bus departs from Hamburg Dammtor station – one station from the Hauptbahnhof. Advance reservations are essential with the bus usually priced around €10 return but at times the service is also offered completely free but bookings remain essential. Designer Outlet Soltau is another factory mall option in Northern Germany but to the south of Hamburg.